I'm thinking of it as the cheater version, cos it's for a party where 95% of the people wouldn't have a clue about screen accuracy. The skirt will be near enough, and the jacket is the bodgy part. The striped corduroy arrived from FFC and it's a stretch woven. An abomination in my eyes! But it's for a half in- & half out-door venue and I don't have to care if I spill party food on it. Which is a winner! It does mean that I can't accurately test the pattern that I'm mocking up, even though I'm flat-lining it with non-stretch. As far as the sleeves go I'm not lining those suckers. I'm cutting out the jacket at lunchtime today, after I mish-mashed the scaled up to 100% NSCT 1793 pattern with the archery jacket pattern via my 1780s polonaise. I really am leaving it to the last minute along with flying by the seat of my pants. Though I've fitted 2 out of 3 of these patterns already. Yes, I dithered and finally got the patterning done last night - went to bed really early 2 nights in a row (Tues/Wed)and got 10 hours sleep each night - so I must have needed it. But that was my pattern work & mock up time. I scaled up the NSCT pattern to 100% and she has approx 31" waist and 38" bust. Which I dont. 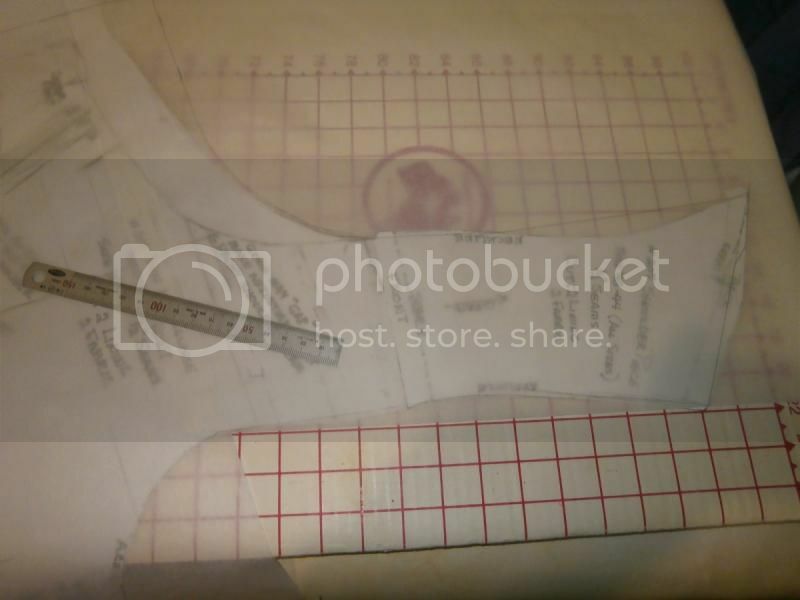 So I got the pattern Desir Brulant lent me for our georgian archery costume, and I bodgied up a frankenpattern based on it. Here's part of the back. I stuck the back & side back together along the seamlines. Mostly, I ignored that they didn't meet in the middle as this added not subtracted a smidge). 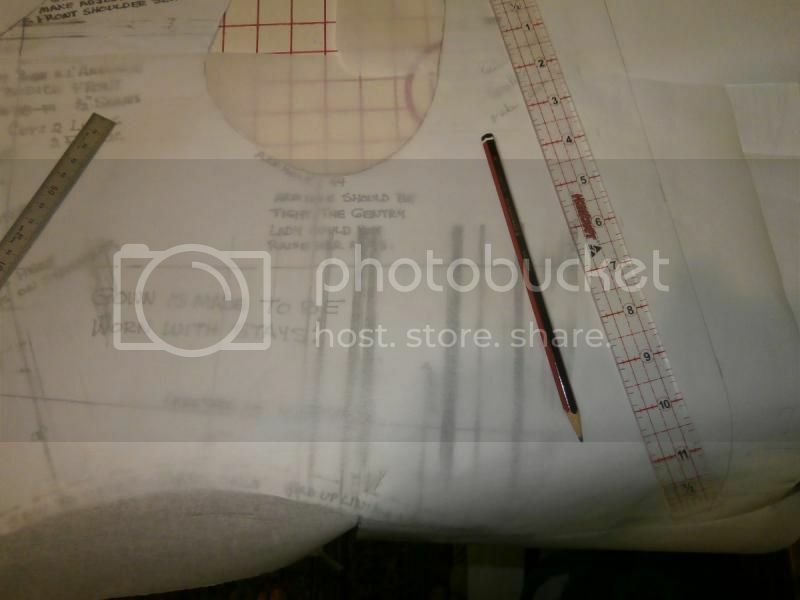 Then drafted a CB piece based on the NSCT but 1" wider, with the pleated hem and then copied the rest of the pattern, guestimating & eyeballing below the waist - based on the NSCT pattern. The top edge needed to be a bit higher for modesty - as "the girls" were so on display with the archer that its hilariously bad. Giant norks are over-rated. I also straightened out some of the shoulder strap edges - after matching the short section to the front on the seamline. And cos this is a quick & dirty costume, not a screen accurate one (LOL the thought with the effort I'm putting in for this party) I'm going to stitch down the fringed yarn I have. Forget seperate piecing for the front. quick.dirty.effective. (Hoping the last one is right). And if you're wondering what I'm making, a friend is throwing a Tim Burton themed party, and I'm making this http://costumersguide.com/sleepy1.shtml.